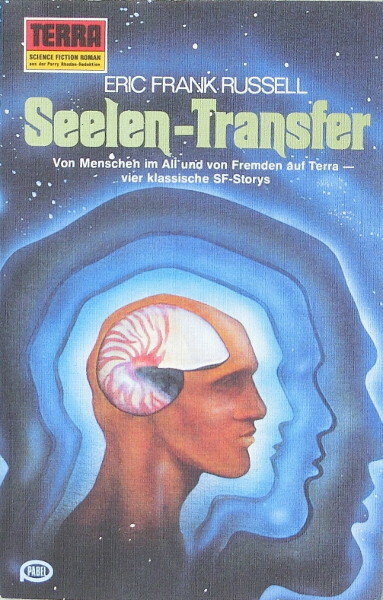 First German edition, first printing (Deutscher Erstdruck on the copyright page). Last page of the collection (159) is unnumbered. The cover artist is not credited. It is the same cover as for the Italian edition of Barry N. Malzberg's The Men Inside found at catalogovegetti.com. Month stated on copyright page ("Juli 1979"); day deduced from the four-weekly distribution schedule of the series. Attention: the page count begins with the cover and the book has no ISBN, since it was not available in regular book shops. Other prices: S 28 (Austria), sfr 3.80 (Switzerland), L 2,200 (Italy), hfl 4 (Netherlands).